Welcome back to Transition Culture… You’re looking well, I hope you had a good break. We start with a warm sunny story to bring a smile on these chilly winter days, kindly penned by May East about the Unleashing, just before Christmas, of the first Transition Favela, in Brazil. It was a sizzling Saturday morning in December when members of the low low-income Brasilândia community of 247.000 people in São Paulo, gathered with great expectancy for the official unleashing of ‘Transixion’ Brasilândia. Led by the initiating group created earlier in May with representatives from the arts community, environmental groups, health workers, educators, local authority and members of Stickel Foundation, the first part of the morning was dedicated to celebrate a remarkable chain of achievements. The Public Space Regeneration group has adopted 7 abandoned places and turned them in community gardens. 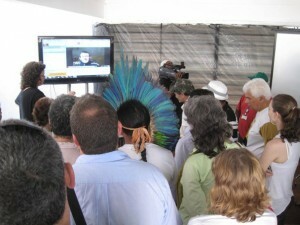 Brasilandia Filmes– a type of “Become your own Media” team- was created, engaging many of the local youngsters who have been filming all transition activities. At the unleashing, Brasilandia Filmes held the world premiere of a 30′ documentary rescuing the oral tradition of many of the guardians of the memory of the region. The old ones who made it to the party were moved in tears re-discovering their relevance to the present and future of the community. The Social Enterprise and Local Business group has learnt with Transition Santa Teresa how to run Exchange Fairs and have offered lively ‘Feira de Troca na Brasa’. They also put together the skills and finances needed for opening a community bakery and a sewing business. 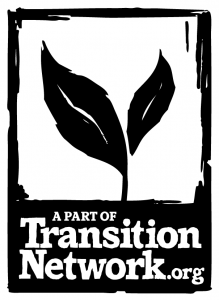 Other working groups include Fair for Sustainable Health– promoting the well-being of community members; Food Security– offering wild harvesting and urban growing workshops; Zero Waste preparing to launch the Estonian scheme for cleaning and eradicating waste in the neighborhood…! The Water and Preservation group involved local children in cleaning a local stream using traditional songs and rituals to baptize/ re-consecrate the sweet running waters. The same group planted the 228 native trees and their intention is to re-forest of 7.7 hectares of the Cantareira Forest over the next 2 years. Bold and feasible targets…! 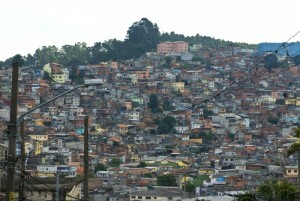 Being neighbors and “potential invaders” of Cantareira Park one of the largest urban forests of the world, the group is now launching a citywide campaign “The Forest Invades the City”. The campaign will be punctuated by a series of awareness raising events promoting the concept of ‘florestania’ (forest citizenship) and agro-forestry activities creating ecological corridors which will connect the mother forest with the urbanized lanes. In the second movement of the morning members of the working groups shared their common vision for the next 20 years, result of a recent back-casting exercise. This was witnessed by a wider circle of community members, reps from the local municipality, health services, Transition USA, Transition Granja Viana. João Leitão from Transition Pombal connected via Skype and shared ideas on how Brazil and Portugal could further exchange experiences and collaboration and later on Rob Hopkins came on line. With an eager audience and faulty equipment we could hear and see Rob but Rob could only see us! One of the highlights was when Japa one of the young Brasilândia movers sang to Rob the Transition Rap, which you can hear here. Rob positioned himself in the flow and unable to listen, danced in sync in the other side of the screen. The crowd was amazed and amused! Other traditional acts came to animate the party. 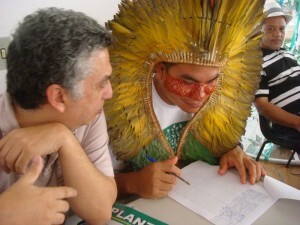 A local samba composer and poet, son of one of the pioneers of Brasilandia, and the young indigenous leader Sia Kaxinaua from the Upper Juruá and Purus Rivers in Western Amazon shared their songs and visions for a resilient and healthy Brasilandia. The unleashing ended in high spirits with all signing the formal document to be sent to Totnes. For all the records this was memorable morning of an enriched community, infected by the transition virus, being translated into a joyful, empowered and unique opportunity of regeneration of their loved Brasilândia- land of Brazil.